Had very little to do before Chelsea's second-half rally, but, when called upon, proved his worth again with two saves to deny Eden Hazard and Gonzalo Higuain. Selflessly committed himself to attacks, complementing Salah down the right wing, and produced a no-nonsense performance at right-back that continues to belie his age. Highlights from Liverpool's win over Chelsea in the Premier League. Slotted back into the Liverpool defence following his midweek suspension and limited Chelsea to a few chances before their formation switch. Another flawless performance at the back from the Dutchman. Marshalled the backline with an assured degree of authority. Another who returned from a Champions League suspension and carried on from where he left off, freezing Callum Hudson-Odoi out of the game with an exemplary defensive performance. Man of the match - with a captain's performance when Liverpool needed it most. With no room for error after City's win at Palace, he set the tone with his driving runs from midfield and crossed brilliantly for Mane's opener. Put fires out in midfield and had the passing range to release Liverpool on the counter. Appears to have finally found his groove at Liverpool, with another industrious performance underlining his credentials to be a regular in midfield. Gave Cesar Azpilicueta a torrid time down the left flank and peeled away from the Chelsea captain to head Liverpool's opener early in the second half. Fantastic in his now trademark role of transitioning from defence to attack, initiating counter after counter. A selfless performance as the other members of Liverpool's attacking trio stole the show. Salah's creativity caught the eye, but his sensational strike will live long in the memory of those fortunate enough to see it in the flesh. Nearly got a hand to Mane's opener but had no chance with Salah's rocket. Offered his defence an out ball and was composed when required to clear his lines under pressure. Composed early on as Chelsea weathered Liverpool's strong start, but grew leggy as the game went on and struggled to handle Mane. Was booked for bringing the Liverpool forward down. Had a calming influence on Chelsea's besieged defence in the first half with classy vision and composure on the ball. Could have dealt with Mane's opener better, but was helpless to prevent Salah's strike. Soldiered on after injuring his knee but succumbed five minutes before half-time. Was sorely missed as Liverpool produced an overpowering second-half display. Struggled to cope with the relentless attacks from Salah, but most full-backs in the Premier League would have. Looks to be growing into the defender Chelsea signed in 2018. 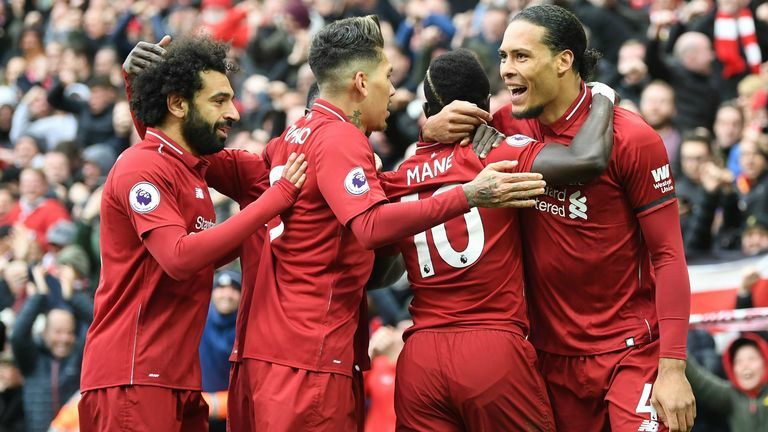 Kept things ticking over in the middle of the park for Chelsea, but was never going to inspire a second-half revival after Liverpool's quick-fire double. Deployed on the right again but managed to juggle those responsibilities with the providing another line of cover alongside Jorginho. A few glimpses of brilliance in a first half which Chelsea spent on the back foot. Never shied away from demanding the ball and driving at the Liverpool defence. Offered Chelsea an out ball as Liverpool applied early pressure on their goal, but really had to take his first-half chance if Sarri's decision not to start with a recognised striker was to pay off. Win a FREE 4-ball giveaway throughout the month of April - a winner a day! Got very little change out of Liverpool left-back Robertson. Was isolated on the right wing and was largely ineffective without a target man to play off. Bashed and bruised early on, but came alive when Chelsea changed systems. Had it not been for Alisson and the woodwork, the Belgian would have had a huge say in the title race for the third time in his career.